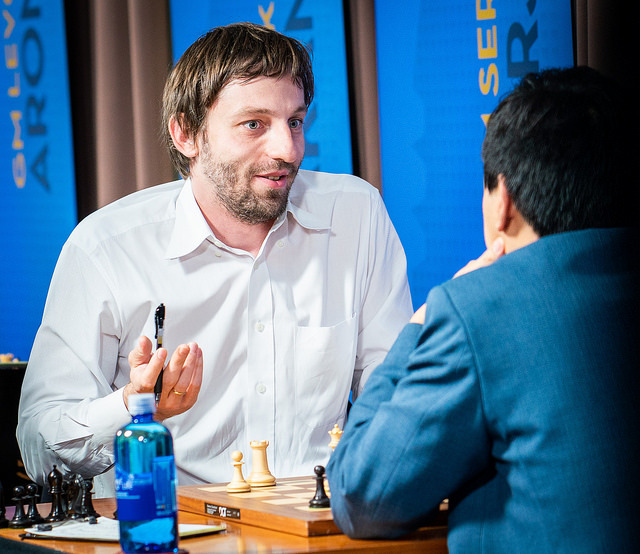 Alexander Grischuk spiced up Round 8 of the Sinquefield Cup by arriving late and playing “The Bird” against Wesley So, but it wasn’t enough to prevent all five games ending in draws for a second day in a row. 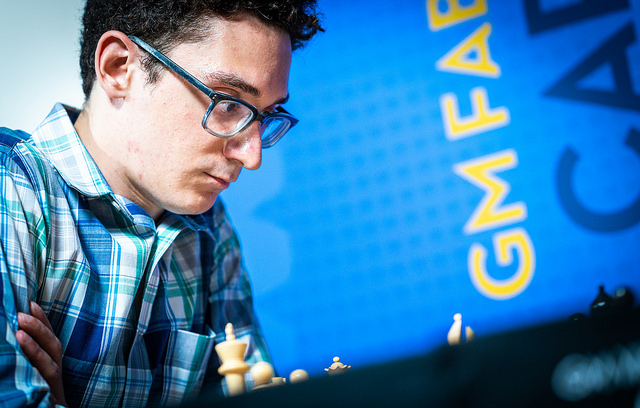 Fabiano Caruana continues to lead by half a point going into the final round after being held by Vishy Anand, while Magnus Carlsen first survived a scare and then was pressing at the end against Shakhriyar Mamedyarov. 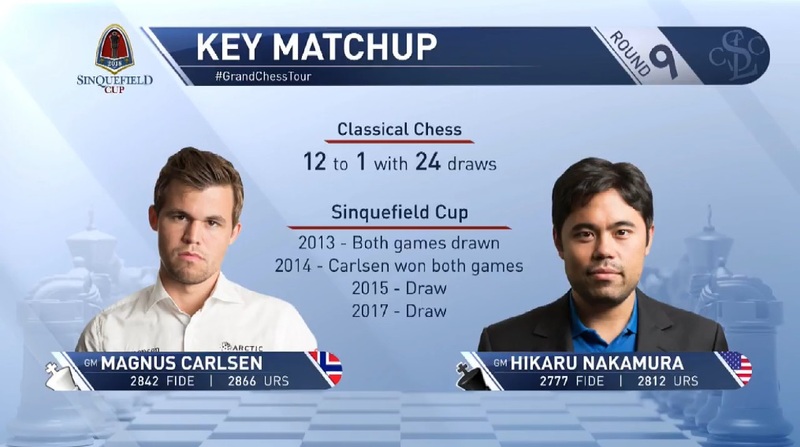 If Magnus wants to win a second Sinquefield title he knows his game against Hikaru Nakamura is close to a must-win encounter. 1. No-one broke clear of the pack – if someone starts a tournament with a string of wins then the chasing pack know they need to take risks to catch up. In this year’s Sinquefield Cup, however, no-one picked up a second win until Caruana in Round 6, so solid play has been enough to stay in contention for tournament victory, or at least a good finishing position. 2. 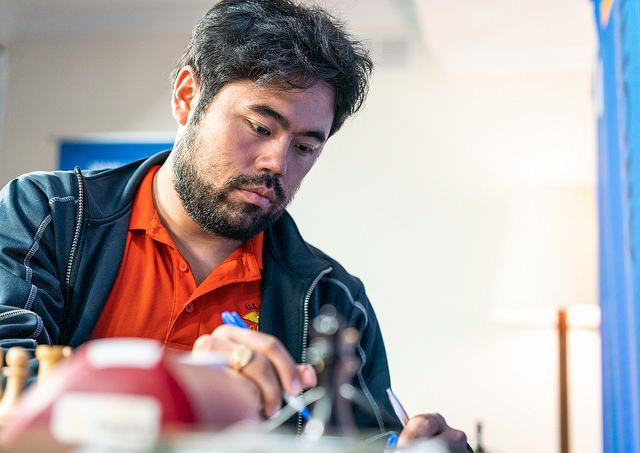 Grand Chess Tour considerations – it’s not just about this one event, so players are also factoring the points they need to qualify for the London Grand Chess Tour final into their thoughts. The best example is perhaps Maxime Vachier-Lagrave, whose eight draws haven’t set the world on fire but have all but ensured him of qualification. 3. The strict anti-draw rules – sometimes these have the paradoxical effect of making players think more about how they can engineer draws, since they know that if they’re not careful they might get stuck for hours playing a position that offers them no hope of a win. 4. 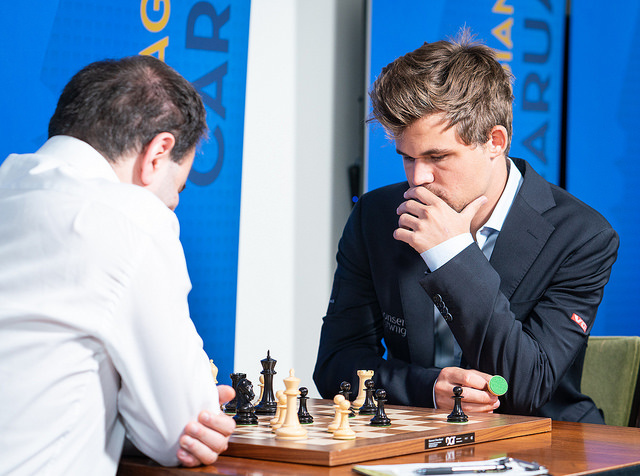 Accumulated fatigue – with the exception of Magnus all the players competed in the physically and mentally draining St. Louis Rapid and Blitz, which unlike a year ago was held before not after the Sinquefield Cup. 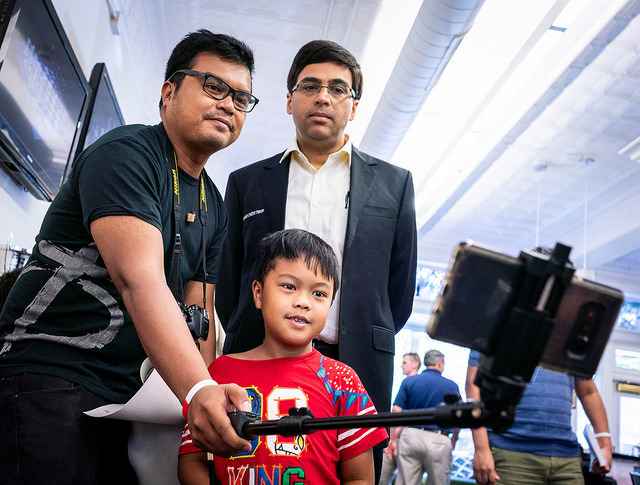 Ultimate Moves and the Sinquefield Cup autograph session and opening ceremony ensured there was no complete break during the two days between the events. Tiredness can lead to blunders and more chances of decisive games, but it also makes people less likely to convert advantages, and of course encourages them to play some lifeless draws to gain an extra rest day. Of course a big factor is simply coincidence, or “life happens”, as Wesley So said in his post-game interview, though it’s more fun to blame Tarjei, or Anish! 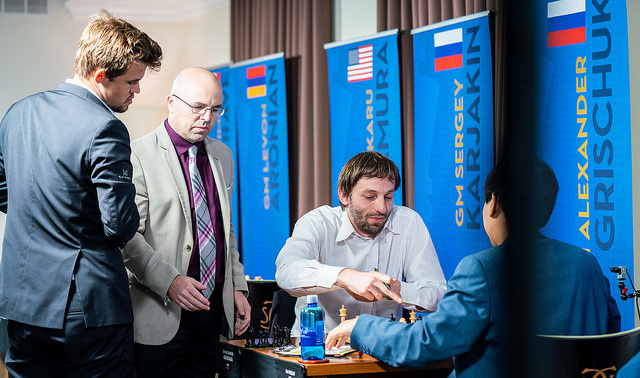 Until recently it looked as though Shakhriyar Mamedyarov was Magnus Carlsen’s “client”. The Azeri no. 1 had lost five classical games to Magnus, with just one victory in Baku back in 2008. Shak has been a man transformed recently, though, and had already drawn four games against the World Champion this year before winning their last encounter in Biel. He said in an interview before the Sinquefield Cup, “I’m sure he’ll concentrate even more seriously on the game against me, as every player tries to strike back after a painful defeat”. I forget that I play against the World Champion! I think only I can win in this position. Good morning. I just woke up from fatigue. Here’s it’s 01:47 at night. Today over the course of more than five hours I played against Magnus Carlsen and, to be honest, the game was a tough struggle. In the opening I had a big advantage, but then I got a slightly worse position. My opponent tried to win it for five hours. Today a journalist asked me why I needed to play so many tournaments. I was too embarrassed to admit that it was because of money. I couldn’t say that a professional chess player like myself has no sponsor and I take part in all tournaments at my own expense, since all the players competing here have sponsors. But tomorrow I have yet another game and need to prepare. Unfortunately I’ve had enough of such chess! I’m tired. Tomorrow I have to play again. Sometimes I wonder whether there are such a large number of strong sportsmen in this country that I can’t find a single sponsor. My love for Azerbaijan is limitless, but my energy has its limits. Someday I won’t be the same Shakhriyar Mamedyarov, and then such conversations will simply be pointless. Thank you for your attention. My odds of winning the tournament are kind of better than they were after yesterday’s game, so the status quo is ok for me. I just need to win my game (with White against Nakamura) and then I’ll have a pretty good chance. I’m definitely an underdog, but there are chances. I thought it was insanely witty, I liked it! … Having said that, these things work better if you convert afterwards! When you have an extremely strong hand and your opponent moves all-in, and to slow roll is to take some time, a couple of minutes, in order to make the call, and it’s considered very bad etiquette. But some players, they slow roll with pocket aces pre-flop, which is extremely stupid, because you are still about 18% to lose, so if you really want to slow roll you should choose when the opponent moves on the river and you have the nuts, so you cannot lose, and then you slow roll, if you choose. So that’s what I mean, that I think he made this too early. It was not completely winning, it was just much better. Fabi’s +2 certainly bodes well for the match. That’s on top of his +4 in Berlin, +4 in GRENKE, +2 in Norway - he’s just having an insane year. I don’t even know what he’s doing, he just wins… His rating is ridiculously high, if not quite his 2014 peak. And Magnus is getting just a bit wobbly. A lot of people would kill for this kind of wobbliness, but he seems to be just a little bit wobbly… That makes for a very interesting match. A few months ago I said, “of course Magnus, but Fabi is dangerous”, or something like that. Now I think it’s just very hard to call. I don’t see a clear favourite. Based on Magnus’s dominance from a few years ago you’re tempted to still say him, but right now it’s not there, and Fabi’s doing very well. I think he’s very motivated, so I don’t see a favourite. I actually think it’s a very open match, depending on who strikes first and all that. It’ll be great to watch! Meanwhile in St. Louis there were two more draws that didn’t inspire too much interest. 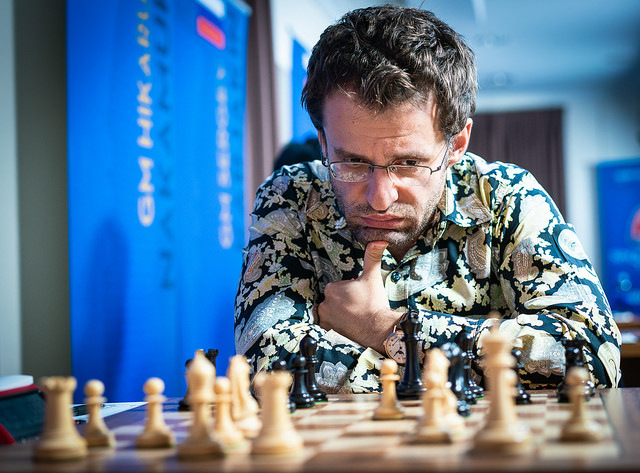 MVL-Aronian was a Berlin Endgame, and though both players could, and did, refer to their impressive record of playing the ending, one result was always likely. It was in fact Black who was soon on top, but as Levon admitted, “unfortunately with the Berlin the best version of the Berlin normally leads to a draw”. 25.e6! It’s remarkable how often this sacrifice works for White in the Berlin. Here it takes the e6-square away from the black king and makes the e5-square available for a white piece, so that 25…fxe6 26.Nxe7 Kxe7 27.Bg5+ Ke8 28.Rcd3 simply led to a quick draw. I have two things on my mind, but I have to be practical about it and not just sacrifice everything for this tournament, because the main goal is to qualify and win the Grand Chess Tour. He thought that Maxime instead would need to push for a win given his tournament situation (half a point further back), but the French no. 1 pointed out that his chances of qualifying for the Grand Chess Tour final would be close to 100% if he drew his last-round game. Hikaru seized the advantage with 17.Nxd5 cxd5 18.Nxc4! but 18…dxc4 19.Bxb7 Rb8 20.Bd5 (20.Bc6! would have pinned the knight) only brought more mass exchanges after 20…Ne5! The game soon fizzled out into a drawn rook ending. Alexander Grischuk is developing a reputation for livening up chess events with some high quality trolling off the board, while in Round 8 it seemed as though he was trying the same at the board as well. He arrived two minutes late and unleashed "the Bird", 1.f4, later telling Maurice Ashley, “I thought about playing it for quite a long time, but just never had an opportunity” - a puzzling statement about a first move for White! The plan here was to play 24.Qxe7 with a comfortable position for White, but Grischuk spotted that his move would run into 24…Qc6+ 25.Qe4 Qg6+ 26.Kh1 and the ending after 26…Rxf1+ 27.Rxf1 Qxe4+ 28.dxe4 Rc8 would be very difficult for White. It was also difficult in the game after 24.Rxf5, but Grischuk correctly noted, “at least in practical play it’s not completely hopeless”. Wesley reflected, “if I was a better player I would have converted this”, but it’s hard to pinpoint exactly where he went wrong. Fabiano Caruana has his fate in his own hands, but has no reason to burn any bridges with Black against Wesley So. The chances of a decisive outcome are boosted by Wesley’s situation, however. As he commented, “I simply have to go all-out if I want to qualify for London”. 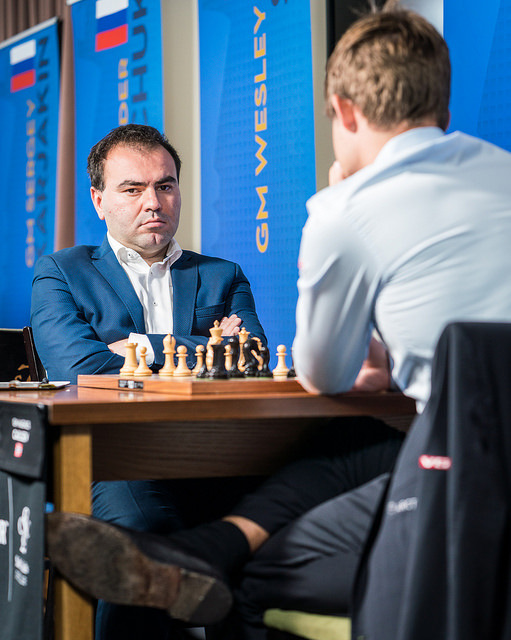 Aronian-Grischuk is a clash of two players just half a point behind the leader, while Mamedyarov, also in that group, faces the tough task of Black against Anand. A potential Sinquefield Cup playoff would consist of a two-game 10+5 rapid match on Tuesday between the top two, followed, if necessary, by Armageddon. 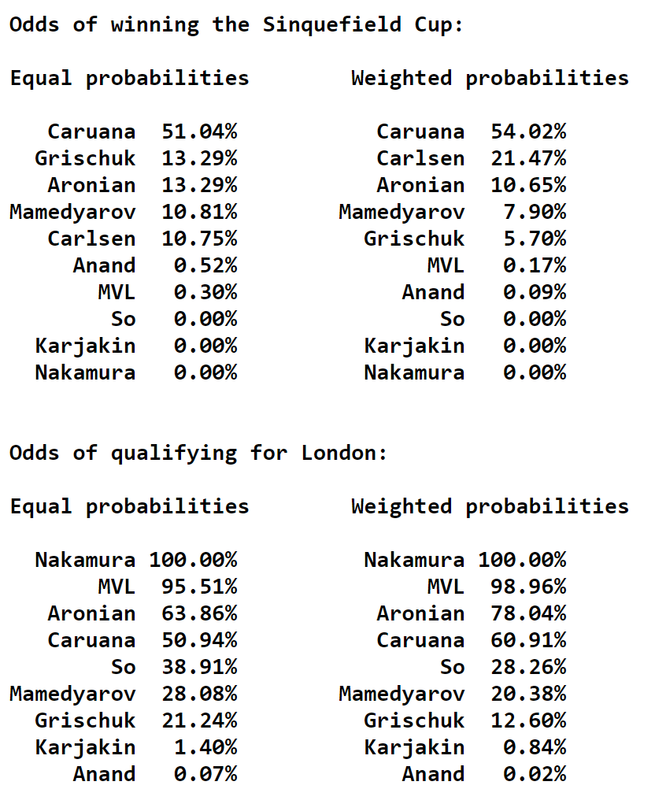 That’s not the only possible tiebreak – if there was a tie for the fourth qualifying place for London we’d get longer 25+10 games to break that tie. In short, it could get complicated, but everything will become clear during the final round! Follow all the action live here on chess24 from 13:00 local time (20:00 CEST) on Monday.